Samsung announces non-hazardous 'fan edition' Note 7 | What Hi-Fi? 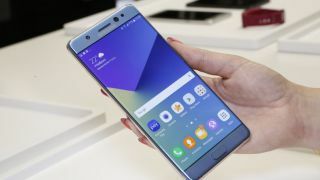 The new Note 7, including components from recalled Samsung phones, is exclusive to South Korea. Remember the Samsung Galaxy Note 7? A pretty impressive bit of smartphone technology with one significant flaw: it kept catching fire, even after Samsung recalled and replaced the batteries. Still, for those in South Korea who nevertheless wish they could have one, there's good news. Samsung has announced the Note 7 Fan Edition. It goes on sale on July 7th. The Fan Edition uses a good number of components from the recalled phones. It's thought 400,000 handsets will be available, with a slashed price of roughly £470. The original Galaxy Note 7 cost approximately £700. Samsung has also changed the battery for the Fan Edition, fitting 3200 mAh batteries (rather than the 3500 mAh equivalent in the original). Samsung says the new battery has passed strict safety tests. Has Samsung got an even bigger problem with exploding phones?